HSGI delivered on an innovative new modular magazine pouch capable of accepting a variety of pistol magazines in a single MOLLE mag pouch! Automatically adapts to your pistol magazine regardless of its caliber or size. The Pistol TACO® will accept double stack .45ACP mags down to single stack 9mm or .22lr mags. 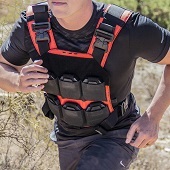 Don't limit yourself to magazines, these modular pouches will also reliably secure other utilities such as your multi-tool, knife, tactical flashlight, suppressor and more. HSGI Pistol TACO® pouches are constructed from Cordura and utilize injection molded polymer sides and are wrapped in shock cord which allows retention and expansion based on the type of pistol magazine being inserted. The tension is quickly adjustable allowing you to customize the grip of your TACO® mag pouch. Internally lined with soft Velcro you can add double sided Velcro to your magazine for additional retention - or - add a shock cord pull top to the top of the pouch.